Orange County Government welcomed the seventh class of local residents to the Orange County Experience program on Aug. 3, 2018 at the County’s Fire Rescue Headquarters. Created in 2012, the interactive series is designed to provide residents a behind-the-scenes look into Orange County Government. The 12-week program offers local residents the opportunity to learn more about the vital services that Orange County Government provides ranging from technology and infrastructure, to public safety, mosquito control, neighborhoods and health and family services. There are 44 participants registered for this year. Orange County Experience Program Manager and Drug Free Office Director Carol Burkett welcomed the attendees to the program. Those present on the first day of the program were briefed on Orange County Fire Rescue and emergency operations. They also took a tour of the 9-1-1 Communications Center, learned Hands-Only CPR, how to operate an AED and spoke with firefighters and command staff as they toured fire rescue vehicles. 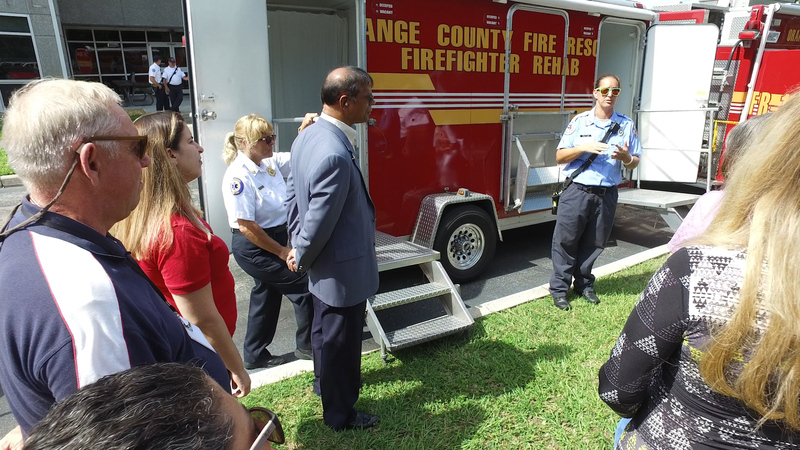 During the Orange County Experience program, residents have the opportunity to meet Orange County staff and take tours of various Orange County facilities, divisions and departments including, the Orange County Convention Center, Fire Rescue, Parks and Recreation, 311, Utilities and more. Orange County’s free non-emergency helpline and chat, 311, connects residents with local government services including animal concerns, neighborhood inquiries, traffic matters, road conditions, debris, downed trees, and more. Residents may dial 311, 407-836-3111 or download the mobile app. Mayor Jacobs began this initiative after she created the Office of Public Engagement and Citizen Advocacy (OPECA) when she was first elected Mayor as a way to engage citizens and employees with the County. OPECA works to make government more accessible to its residents and provides the opportunity for citizens to become more involved. Photo Caption: Orange County Fire Rescue speaks with Orange County Experience program members about day-to-day department responsibilities.